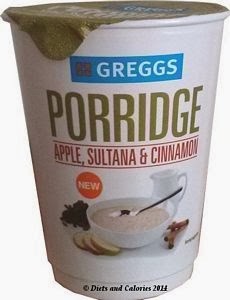 How do you like your porridge in the morning? Cooked traditionally in a pan and simmered for several minutes. Or do you prefer the quick and easy option of popping an instant pot or packet into the microwave for a couple of minutes? And what if you don’t have time to even do that? No problem. 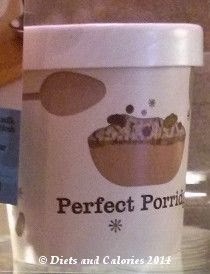 These days most popular coffee shop chains like Starbucks, Costa Coffee and Caffe Nero sell ready to eat porridge. You can eat it in-store or take it away on your way to work or wherever you’re heading off to. While porridge is recommended as a healthy breakfast, this mainly applies to the plain varieties. Many porridges come pre-sweetened with sugar and/or other ingredients which increases the calorie value. Not all stores use the same amount of sugar and there is quite a difference between outlets and porridge flavours. 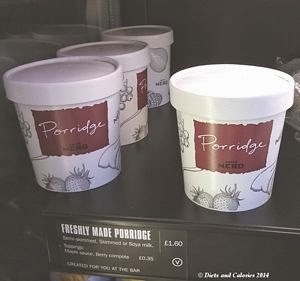 To help you see how they compare, here’s a list of some of the porridge pots you can find in high street outlets – including McDonalds and Greggs. Each chart shows the number of calories, fat and sugar grams per pot, as well as the number of teaspoons of sugar in each porridge pot. It's great that so many stores are selling porridge. But if you're trying to be more healthy by cutting down on sugar, then it's best to choose the plain varieties and add your own sweetener if preferred. Healthier choices include Stevia or low sugar fruit. 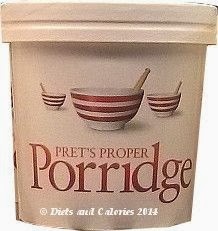 If you're interested in comparing the sugar and calories in those instant porridge pots you can buy from supermarkets, here's a list of 61 different brands and varieties of porridge - in order of teaspoons of sugar per pot!